I had the great opportunity to review Country Bob's All Purpose Sauce! How does anything really good get its start? Where do great products come from? Usually they are the result of much time being exerted and a tremendous amount of love being invested. At that point you can say, "That's mine! I made that." That's the way Country Bob Edson created his All Purpose Sauce. In 1968 Country Bob perfected the sauce of his dreams. After years of giving the sauce to friends and family he began to sell it in 1977. The reaction was overwhelming just as it is today. Almost everyone who tries Country Bob's All Purpose Sauce becomes a lifelong user. And why not, it is the perfect complement to practically any meal set on your table. It was actually October of 1982 when Country Bob, Inc. became the company, which remains today. Bob Edson, Terry Edson, Al Malekovic and Reed Malekovic formed a corporation with equal ownership. Since that time Country Bob's distribution has magnified regionally in all directions from our corporate office located in Centralia, Illinois. Even with the tremendous growth we have not forgotten where we came from, continuing in our relentless pursuit of product excellence. Along with our All Purpose Sauce we have expanded our product line to include BBQ Sauce, Seasoning Salt and Spicy All Purpose Sauce. With our fully automated bottling line we also have the capability of producing Private Label products for stores or restaurants. It would be nice if we could claim responsibility for the success of the company, however, credit must be given where credit is due. Proverbs 16:3 says, "Commit to the Lord whatever you do, and your plans will succeed." We have placed true ownership of Country Bob, Inc. in the hands of God. "Christ is our CEO" and He is an Awesome Boss! You can use this All Purpose Sauce on: Steak, Chicken, Barbeque, Fries, Hamburger, Fish and so much more! These can be purchased at most local grocery stores, i.e. Kroger, Walmart, etc. Try it out today! We have tried ours on many things ... I used some in our Sloppy Joes for an extra tangy taste!! It is great! 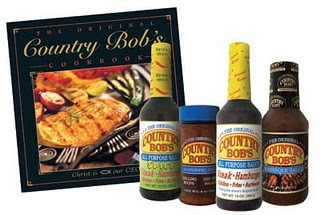 Two Lucky readers will recieve two Bottles each of Country Bob's All Purpose Sauce!! Mandatory Entry: (you must complete this entry in order for the others to count) ~ "LIKE" Country Bobs on FACEBOOK and tell them that Mommy's Moments sent you by and thanks for offering the giveaway! * Share this giveaway on Twitter or Facebook using buttons below and leave link. All entries must include your e-mail address! Thanks Al at Country Bob's for allowing me to host this review/giveaway! I love your product and that Country Bob's is a Christian Based Company!!! Winners are chosen by Random.org ~ Winners have 48hrs. to reply to my email or another winner will be chosen. FTC Disclosure Info for this Giveaway: This is not a paid insertion. This is a non-compensated post and all opinions regarding the product and the sponsor are my own experiences. I was provided product to facilitate the review and giveaway. Sponsor is fulfilling directly to prize winner(s), this in no way influenced my opinion of the products. Once a winner is selected and their information has been forwarded to the sponsor, the responsibility of prize fulfillment, rests with the sponsor. I'm now a fan of yours on Facebook. I "like" Country Bobs on FACEBOOK (Leann LaPresti) and told them that Mommy's Moments sent me and thanked them for the giveaway! * Voted for you on Picket Fence. I'm a fan of Country Bob's on Facebook! Also a fan of Mommy's Moments on facebook! i was already a country bob's fan, but i thanked 'em for sponsoring your giveaway! thanks for the opportunity. I LOVE COUNTRY BOBS. SHOUT OUT FROM ILLINOIS. Mommy's Moments sent ME and thanks for offering the giveaway!